While I love writing about beer, talking about beer, drinking beer, I also love to drink that beer with really awesome food. That is now going to happen a lot, as I plan on making the 2nd Shift tasting room a regular stop when I need to write, drink and eat. 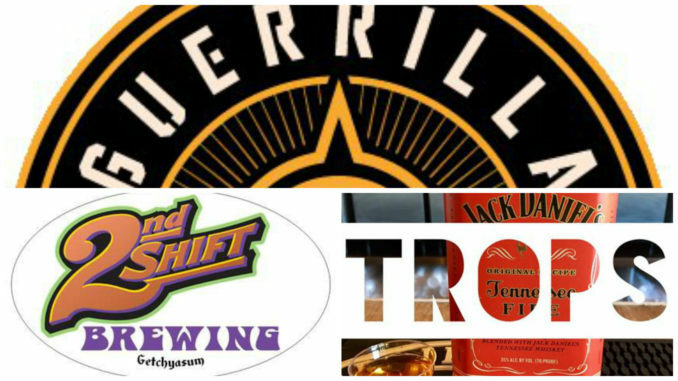 Starting July 5th, Tower Grove East’s own Guerrilla Street Food (3559 Arsenal St, St. Louis, MO 63118), will be setting up shop inside 2nd Shift Brewing (601 Sublette Ave, St. Louis, MO 63110). This means you can enjoy your Katy or El Gato Grande while scarfing down some Flying Pig or a 800 LB Gorilla. This, while the fast growing, laid back Filipino concept restaurant is also working it’s third location inside the new Tropical Liquers in the Grove. The reason for the quick start date is that 2nd Shift already has a built-out kitchen and the menu will feature dishes from the current “Old School” menu and then eventually expand to include 2nd Shift-specific dishes as well.